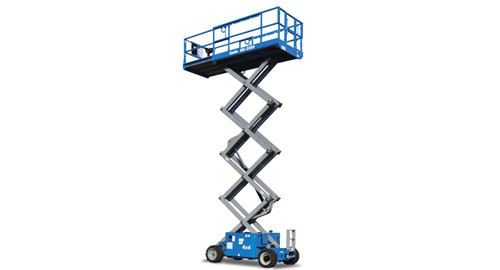 26 Foot Scissor Lift Rental – Rough-Terrain – Genie GS-2669 DC, is available for rent in Rochester NY, Ithaca NY and the entire Western New York region from the Duke Company. The Genie GS-2669 DC, rough terrain scissor lifts is ideal for indoor and outdoor applications including construction and maintenance. It is a powered by an electric drive motor, and its rough terrain capability enable it to drive through dirt, sand and mud.